Because we live in an insane country whose major media largely cannot conceive of politics as anything other than a horse race, the 2020 Democratic primary has already effectively begun. While you are correct to groan at this grim reality, the contenders are announcing and staking out policy positions, so we don’t really have a choice in the matter. This is happening. The good news is that it’s become pretty clear what the 2020 Democratic primary is going to be about: who can win over the progressive wing of the party, and who is setting the policy agenda. 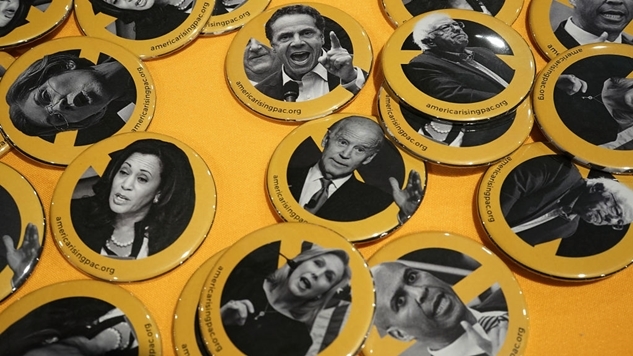 For example, no one had heard of the Green New Deal until late 2018, when Alexandria Ocasio-Cortez joined Sunrise Movement’s protest outside Nancy Pelosi’s office (much to the chagrin of D.C. media’s Most Serious People), and now we are entering 2019 with multiple top tier contenders endorsing the “idea” of the only policy proposal put forth that scientists say is adequate to address the gargantuan and seemingly impossible challenge that is climate change (the reason they are hedging with the word “idea” is because unlike Medicare for All, there is no specific bill presented to Congress—yet). Speaking of Medicare for All, in the span of about 18 months it went from a pipe dream to the status quo. Medicare for All is such an overwhelming winner in the court of public opinion, that a majority of Republican voters say they want socialized medicine. Forty-three percent of the Democratic electorate did not vote for the establishment’s hand-picked candidate in 2016, and that coalition has only grown in the years since. The policies which Bernie espoused have been scattered across the Democratic chessboard, and they are being picked up by candidates who want to prove to the electorate that they can satisfy the entire nation’s insatiable thirst to do something big to try to unmoor us from this untenable status quo. Here are the progressive platforms that the top ten presidential contenders will be running on, per their own words, along with their odds of becoming the Democratic nominee in 2020, per the odds on Betfair as of this writing. Note: In gambling parlance, something like (+200) means that you are betting $100 to win $200 on that thing happening. The better the return on your $100, the less likely that event is to occur. As far as what she means by “The environment”? Joe Biden has no chance. Everyone will be running to his left. This is the only 2020 prediction that I'm comfortable making right now. I've introduced legislation called the Marijuana Justice Act that would deschedule marijuana and apply that change retroactively to people currently serving time for marijuana offenses. Critics question whether we can afford #MedicareForAll. The real question is how much longer can Americans afford not to? Our current health care system leaves too many uninsured or unable to access the care they need. That's why we must pass #MedicareforAll. If Republicans could give $1.5 trillion in tax cuts to corporations and the wealthiest among us, why can't we invest a similar amount in a guaranteed jobs plan for regular Americans who are unemployed and willing to work to better their local community? But a deeper look at Gabbard's political career shows that she is devoted to attaining power and to the perpetuation of extremist, fringe ideology. She adopts and sheds extremist positions at will, but one thing remains constant: her consistent embrace of hard-right politics. Glass-Steagall has bipartisan support: from @SenSanders to @realDonaldTrump; both @TheDemocrats & @RNC platforms. Let's get this done. Warren also supports the Green New Deal, and an ambitious plan to take on Big Pharma by getting the government into drug manufacturing. This energy future must be based on a combination of homegrown energy sources, new energy technologies, energy efficiency measures, and expanded domestic energy production. In Minnesota, we have the talent and know-how to innovate and the natural resources to propel our economy forward. I believe this is a great opportunity to meet our nation's energy demands and promote economic development across America. It's pretty simple: in the next 12 years we need to get the United States economy down to zero carbon emissions while also creating technology to aid India and China in that seemingly impossible quest, or else the planet will irrevocably and cataclysmically change in 20 years. Anyone proposing an increase in oil production in 2020 is simply not up to the titantic challenge we face. If this is still Klobuchar's position come 2020, she will find herself on the right flank of the Democratic field. Brown did not throw his support behind Sanders’ Medicare for All bill, as he instead endorsed a less ambitious plan to allow people to buy in to Medicare at 55. He also said he did not know enough about the Green New Deal to take a position on it—which is fair given that there is no formal bill to parse through yet. The “idea” of the GND is simply to completely de-carbonize the economy. Brown has a record of being one of the most liberal members of the Democratic Senate who takes on Wall Street, so he will almost certainly fall on the left flank of the field if/when he jumps into this with two feet. Although, being a liberal member of the senate isn’t saying much given that the Senate unanimously reelected Chuck freaking Schumer. It’s a fact that your average Democratic Senator is to the right of your average Republican voter on Medicare for All. Whatever happens in 2020, a progressive agenda will almost surely be at the center of it (unless we take another step forward into hellworld and wind up with something like Bloomberg vs. Biden). Policies like socialized medicine can win over conservatives, and a lot of the polling from places like Data for Progress demonstrates that big, progressive reforms are extremely popular with a significant majority of Americans. Milquetoast centrism is out, and bold progressivism is in. Hillary Clinton may have won the battle in 2016, but the 2020 field has made it clear that Bernie Sanders won the war.